Keto Bread is kind of like the holy grail of low carb baking and I really think we we’ve nailed it with this recipe! 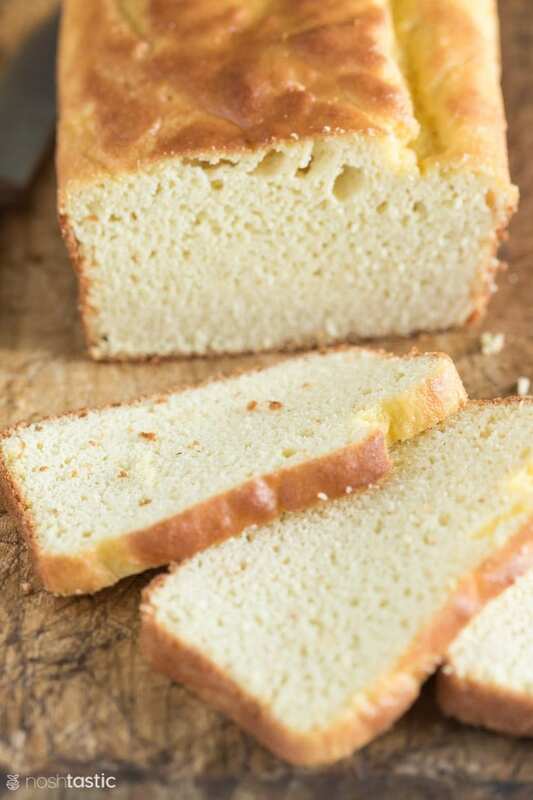 This low carb Keto bread does not require you to whip egg whites, add quirky ingredients, or use yeast, and no eggy taste, it’s about as simple as it gets to make. For my easy Keto bread recipe I tested, retested, and tested again with various different low carb ingredients, cook times, and methods before settling on this recipe as the best low carb bread recipe we’ve made so far, I think you’ll love it! Then go ahead and line a 8.5 x 4.5 inch loaf pan with parchment paper and set aside. Mix all your wet ingredients including the yoghurt, olive oil, and eggs, and they also need to be at room temperature too. Now all you need to do is add the dry bread ingredients to the wet and mix well together, then pour into the lined loaf pan. Bake at 350F for around 45- 50 minutes until the loaf is crusty on top. There is a certain texture that many low carb bread recipes have, it can be almost sponge like and is sometimes a little on the wet side depending on the ingredients so I like to slice the bread and let the slices ‘dry out’ for about an hour and I think the texture it much improved this way. So let’s be honest here, this recipe and all Keto bread recipes are not anywhere close to wheat bread, at least not in my book. Now that doesn’t mean they are bad, not at all, but you do need to adjust your expectations. 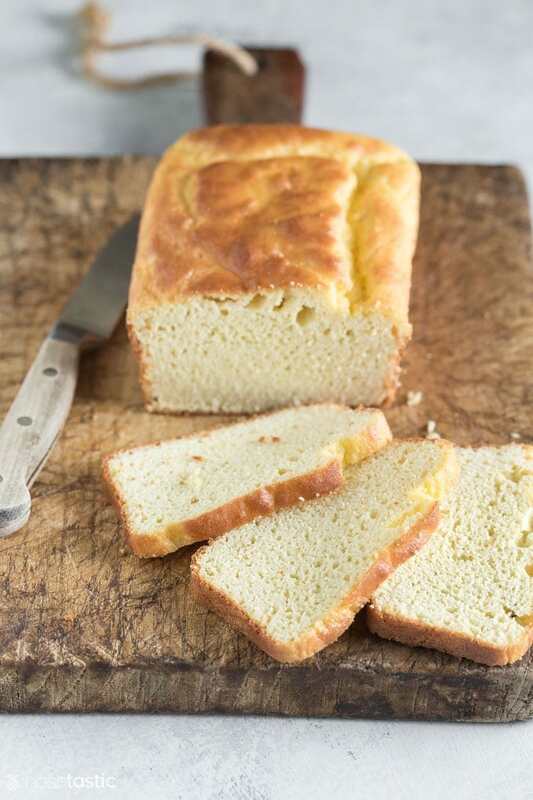 Remember for Keto baking and making Keto bread in particular we are somewhat limited to using only a couple of non grain gluten free flours, usually almond flour or coconut flour, or a mixture of both. Now some recipes also like to use things like yeast, ground chia, ground flax, and a couple other things to help with texture. Well, I have made many of the most popular Keto recipes recipes on the internet and while many of them were good, I wanted to create one that was simpler and didn’t require looking on the internet for specialty ingredients just to make a loaf of bread. Plus, can I just say that the taste of flax in keto bread was something I really did not care for, it has an almost bitter taste I thought, so that had to go. 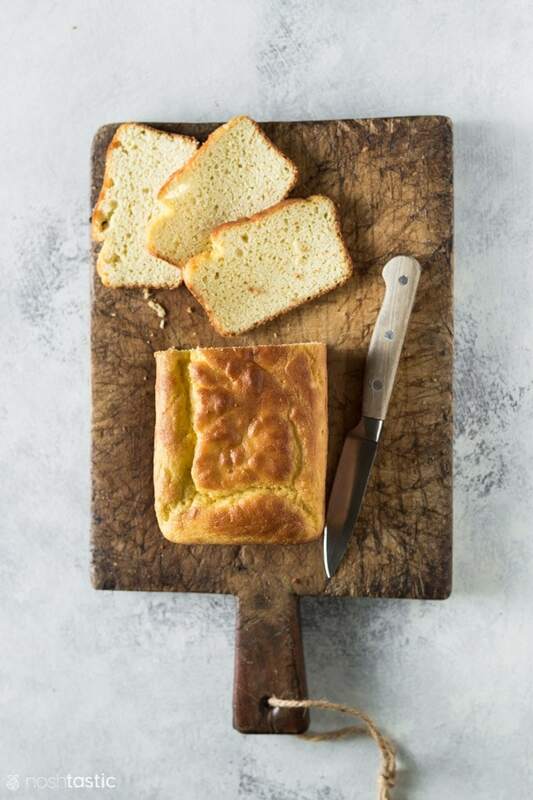 Also common between many of the Keto bread recipes is a kind of spongy texture and the bread can appear almost wet, with some recipes producing more ‘wet’ bread than others. I have tried to minimize this in my recipe, but my best tip for getting your keto bread to dry out a little is to slice it ahead of time and literaly let the individual slices dry out for at least an hour. Now it’s perfectly nice to eat without this, but if you have time I’d try this tip and see how you like it. And my last tip is to wait until your low carb bread is fully cooled before you slice into it, this will help a lot. I was able to get very thin slices from it when it was cooled, it’s a dense bread so you probably don’t want to eat massive slices as it’s very filling. Can I make this Keto bread in a bread maker? A bread maker is not necessary for this recipe, but if you have one you could try it to bake it in if that’s more convenient. However, the dimensions of the pan inside your bread maker may be totally different to the loaf pan size I recommend and that will affect the outcome and bake time. Remember, this is a gluten free grain free bread recipe and as a result we don’t need to go through the usual cycle of kneading the bread dough to activate the gluten (there’s no gluten in this recipe). Almond flour – you may be able to substitute with another ground nut flour or sunflower seed flour, I’ve not tested it with either. You cannot substitute with coconut flour, it will not work as they are too different and the proportions would be way off, you’d be better to look for a bread recipe that’s been created specifically to work with coconut flour if that’s what you’re looking for. Eggs – there’s no substitute for this recipe, I’m sorry! While flax or chia eggs work in many baking recipes unfortunately they won’t work in this one. Natural yoghurt – you could also try Daisy brand sour cream (or any other brand without added starch) or you might want to try full fat coconut milk, but I’ve not tried either. 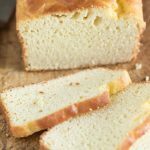 This is a delicious easy low carb Keto Bread, it contains no yeast, does not taste eggy, and is very simple to make. All ingredients must be room temperature before you start, so remove them from the fridge first and let sit for at least 30 minutes. You can put the eggs (still in the shell) in a bowl of warm water to warm up if you need to speed up the process. Line a 8.5 x 4.5 inch loaf pan with parchment paper and set aside. Mix all the dry ingredients together including almond flour, baking powder, xanthan gum, fine salt. All wet ingredients must be room temperature. Mix together the eggs, egg whites, olive oil, and natural yoghurt, beat with a whisk until well combined. Mix the dry keto bread ingredients into the wet ingredients, then put in parchment lined loaf pan and use a spatula to spread out the bread dough. Everything must be at room temperature, this includes the eggs, water, yoghurt, and oil. I like to cut the bread and let the thin slices 'dry' out for an hour or so, the texture improves in my opinion if you have time to do this. I’ve tried so many keto bread recipes and they were no good, at least not for me. This recipe is my new favorite! I mean it’s not like real bread and I wasn’t expecting that but the taste and texture is very nice for low carb bread and it’s not eggy like some are, thanks for a great recipe! This was my first time to bake any keto bread recipe and I’m very pleased with the result. I didn’t have aluminum free baking powder so I used what I had. How will the bread differ with the aluminum free baking powder? And can I freeze the bread? Another similiar recipe said freeze with pieces of wax paper between the slices. Thank you! Thank you Liz, yes, you can freeze it! I usually bag it up with was paper in between two slices as I’m the only one eating so two at a time is enough for me. I hope this Bread is Good, I’m going to try &’make it. I made cinnamon bread today, starting to miss it. So glad it worked, though I promise it works well as written without any yeast! I tested multiple versions and I found adding yeast didn’t wasn’t beneficial.